Measuring and testing inside hydraulic circuits is a key measure to ensure continuous system safety and performance. VOSS Fluid has revolutionised the necessary measuring technology with regard to operability, easy assembly and durability. Its portfolio boasts a versatile range of measuring couplings with various types, hoses and adapters. In addition to the standard colour blue, the protective caps can also be produced in many other striking colours. This, for instance makes it possible to differentiate between different hydraulic circuits. Hydraulic systems require user-friendly and leak-tight measuring couplings so that measuring and testing devices can be connected and disconnected at any time or permanently installed. This allows the hydraulic pressure to be measured, controlled, filled or vented during ongoing operation. VOSS Fluid has a new, extensive range of measuring couplings for this as well as other applications. A main feature is the cap with a permanently elastic and tear-resistant plastic element that does not loosen, even when subjected to strong vibrations. In addition, the cap protects against external environmental factors like dust and moisture. 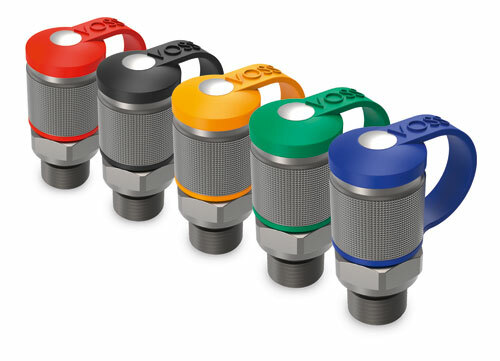 VOSS Fluid also sets a new standard in functional colour design. The protective caps are available in the colour blue for series production. Red, green, yellow and black, as well as customised colour selections are also possible options. The deliberate selection of different striking colours facilitates work for machinery operators. The operator recognises diagnostic points on the measuring couplings from a distance and also has the option of labelling various hydraulic circuits, like high and low pressure, with a separate colour. The company thereby optimally combines appealing industrial design with functionality. The additional soft-sealing of all leakage paths ensures the high level of tightness in VOSS Fluid systems. The combination of metal and soft seals increases the quality of tightness protection immensely in comparison with other solutions available on the market. Furthermore, the metal components of the measuring couplings feature a zinc-nickel coating. This way the entire system offers long-term corrosion protection. In addition to main components, the range of measuring couplings also includes a large number of adapters and measuring equipment hoses. The measuring equipment hoses are designed to be exceptionally stress-resistant and are thereby also ideally suited for potential continuous operation. Before introducing it onto the market, VOSS Fluid thoroughly assessed its new range in order to redefine the standards of user-friendliness and practical applicability of measuring couplings. In addition to extensive pressure loads, influencing factors like sludge deposits, UV radiation, corrosion protection and spray water under high pressure were also tested. Furthermore, each individual measuring coupling is subject to a standardised function test before it is delivered to the customer. This guarantees that the measuring coupling range offers users definite added value, ensuring functional reliability of measuring technology from day one.